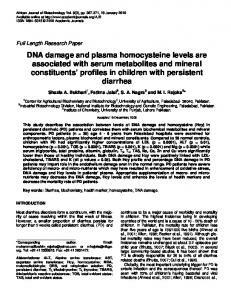 Jul 24, 1997 - disease, including homocysteine levels, were evaluat- ed. The majority of the patients subsequently ..... ed in the final model. ..... McCully KS. RESPONSE TO LETTER TO EDITOR. 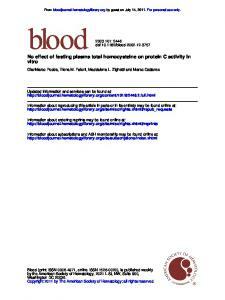 Response to “Plasma Homocysteine Levels and Endothelial. Dysfunction in Cerebro- and Cardiovascular Diseases in the. Jan 18, 2010 - longer than 2 weeks called persistent diarrhea (PD) and. *Corresponding author. .... burden of disease and the childhood-underweight is the. Apr 11, 2014 - are also associated with a lower risk of cancer  and decreased cancer ... mortality in older adults using data from the US National Health and Nutrition ... into a standardized list of 113 causes based on the International. www.ijsrp.org. 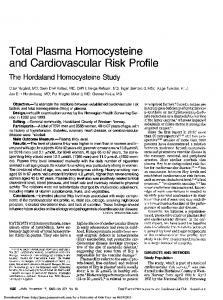 Correlation of Plasma homocysteine levels with BMI and. 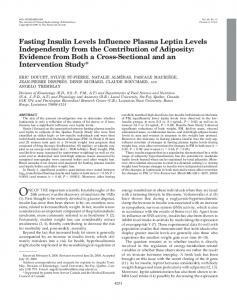 Insulin Resistance, amongst Obese, Overweight and Non. Obese Infertile Women. the prevalence in people with diagnosed diabetes (36%). There was a sharp increase in retinop- athy prevalence in those with A1C 5.5% or FPG 5.8 mmol/l. 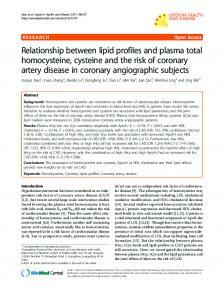 Jun 28, 2017 - (2017) Fasting plasma glucose and .... lipoprotein cholesterol (HDL-C) (IRC method), serum low-density lipoprotein cholesterol ... 47 (37, 58). idney transplantation is the preferred treatment option for patients with ESRD, because it offers greater longevity and quality of life at a lower cost compared with hemodialysis and peritoneal dialysis (1). However, donor organs are scarce, and waiting times for cadaveric kidneys have soared. Currently, more than 55,000 patients are on the waiting list for a kidney transplant in the United States alone (2). Luckily, the median patient and graft survival for kidney transplant recipients (KTR) has increased in the past decades. Nevertheless, with improved immunosuppression and early allograft survival, chronic allograft nephropathy is now the dominant cause of kidney transplant failure, which imposes a great burden on this patient population and on society as a whole (3). Hence, identification of risk factors and development of effective treatment strategies to prevent these outcomes are of paramount public health importance. low-up (13). To our knowledge, no prospective and long-term studies have been published on the associations between plasma tHcy levels and patient or graft survival in KTR. To fill this void, we tested prospectively the hypothesis that baseline fasting plasma tHcy level was associated with patient or allograft survival in KTR. Materials and Methods Study Population and Data Collection Between 1996 and 1998, we prospectively enrolled into this study 733 stable KTR who received routine follow-up at the transplant clinic of the Vienna General Hospital. All patients gave informed consent in accordance with the Declaration of Helsinki and the Austrian Law on Gene Technology, and the study was approved by the Institutional Review Board. At baseline, we assessed each patient’s age, gender, underlying renal disease that likely caused the kidney failure, number of previous kidney transplants, time from first renal replacement therapy to transplantation, and time since the most recent kidney transplantation. Body mass index was calculated as the weight in kilograms divided by the squared height in meters. The immunosuppressive regimen at study baseline was also recorded. During the baseline visit, blood was drawn from each patient for laboratory analysis. Plasma tHcy was measured using standard methods as described previously (12). Furthermore, we measured each patient’s total cholesterol, triglyceride, C-reactive protein, and creatinine level. We then used the Cockcroft-Gault formula to estimate the GFR (14), which was standardized to a body surface area of 1.73 m2. From the registry of the Eurotransplant Foundation, the joint organ procurement agency for Austria, Belgium, Germany, Luxembourg, The Netherlands, and Slovenia, we obtained information on the organ donor (donor age, gender, and living versus deceased donor) and on the specific circumstances of the transplantation procedure (cold ischemia time, number and type of human leukocyte antigen mismatch, and recipient panel reactive antibody titer). Longitudinal information on all dialysis patients and KTR residing in Austria is routinely collected by the Austrian Dialysis and Transplant Registry (OeDTR). Follow-up in this database has been 100% complete for many years, and reliable information on timing and occurrence of patient death and modality switches, such as reinitiation of maintenance dialysis after kidney graft failure, is available for study. The outcomes of this study were all-cause mortality and kidney allograft loss; the latter was defined as the composite end point of patient death and reinitiation of maintenance dialysis. Additional analyses using graft failure as the main outcome but using death as a censoring rather than an outcome event were also conducted. J Am Soc Nephrol 16: 255–260, 2005 variable of interest, plasma tHcy, was dichotomized at 12 ␮mol/L, a commonly used cutoff point for normal versus elevated levels of that atherogenic marker (16). For multivariate model building, we used an automated stepwise variable selection procedure that included into the model all variables at P ⬍ 0.20. Recipient age and gender as well as estimated GFR were forced into all models. From there, we introduced all other variables individually and then assessed whether they confounded the association between the main exposure variable (defined as a change in the regression coefficient ⬎10%), in which case the variable would be included regardless of the significance level. We used the SAS for Windows (Release 8.2; SAS Corp, Cary, NC) software for all statistical analyses. Results From the 733 patients originally included in the study, 7 were found to receive their routine transplant care outside Austria and were excluded. For 16 patients, information on their donors was unavailable from the Eurotransplant Foundation registry. The remaining 710 patients constituted the final study cohort. On average, patients had received their current transplant 5 yr before enrollment. The mean age was 52.2 yr, and 60.1% were men. 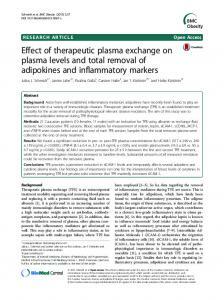 The mean estimated GFR was 55.8 ml/min per 1.73 m2, and the mean plasma tHcy level was 17.2 ␮mol/L. One quarter (24.8%) of the patients had a tHcy level within the normal range (⬍12 ␮mol/L), and the remaining patients (75.2%) had an elevated plasma tHcy. Patients with an elevated tHcy level were more likely to be male (P ⫽ 0.003); were more likely to have a lower kidney function (P ⬍ 0.001); differed with regard to their native kidney disease (P ⫽ 0.03); and were more likely to have an immunosuppressive regimen that contained cyclosporine A, corticosteroids, and azathioprine (P ⫽ 0.002; Table 1). These KTR also had received their organ from an older donor (P ⫽ 0.04) and were more likely to have had a panel reactive antibody titer ⬎50% before transplantation (P ⫽ 0.02; Table 2). Other baseline characteristics (Table 1) and specific characteristics regarding the transplantation procedures (Table 2) did not differ by baseline tHcy level. Endpoint: All-Cause Mortality During a median follow-up of 6.1 yr (3798 person-years), 154 patient deaths were recorded (crude incidence rate 40.6/1000 person-years). From a Kaplan-Meier plot of cumulative survival stratified by quartile of tHcy (ⱕ12, ⬎12 to 15, ⬎15 to 19.8, and ⬎19.8 ␮mol/L), it was evident that all-cause mortality increased monotonously with higher tHcy levels (P ⬍ 0.001, log-rank test; Figure 1). From Cox proportional hazards models, we found that KTR with elevated baseline tHcy levels (ⱖ12 ␮mol/L) experienced nearly three times the mortality rate of patients with normal tHcy levels in univariate analyses (HR 2.72; 95% CI 1.66 to 4.45). After multivariate adjustment for other risk factors and confounders, this association was slightly attenuated (Table 3). Patients with elevated tHcy experienced a 2.44-fold mortality risk compared with patients whose tHcy was within the normal range (HR 2.44; 95% CI 1.45 to 4.12). Next, when testing the robustness of this finding by excluding the 70 patients whose graft function seemed already to be substantially impaired at baseline (GFR ⬍ 30 ml/min per 1.73 m2), we obtained a very similar result (Table 3). tHcy, total homocysteine; RRT, renal replacement therapy; MMF, mycophenolate mofetil. Missing in 7 patients. with normal tHcy (HR 3.28; 95% CI 1.98 to 5.43). However, when controlling for several other variables, the finding was substantially attenuated and was no longer significant (HR 1.35; 95% CI 0.79 to 2.32; Table 3). For all three outcomes, we conducted additional analyses using information on anemia, serum calcium and phosphorus, or calcium/phosphorus ion product. Inclusion of these variables did not change the results in a meaningful way. Furthermore, we explored the possibility of effect modification among the available variables. Although we did not find any interaction terms to be significant, the power to do so was likely limited in this study. Finally, we did not find any indication that collinearity had led to artificially inflated CI in this study. Figure 1. Cumulative patient survival plot by quartile of plasma total homocysteine level. Figure 2. Cumulative allograft survival plot by quartile of plasma total homocysteine level. tHcy plasma levels, providing a potentially easy and inexpensive way to reduce the rates of these undesirable outcomes in this vulnerable population. 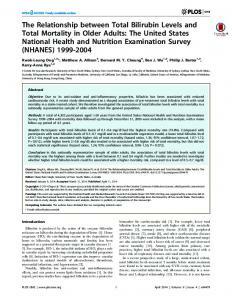 However, the utility of vitamin supplementation is unknown. This underscores the importance of the ongoing Folic Acid for Vascular Outcome Reduction in Transplantation (FAVORIT) study, a nationwide, multicenter, clinical trial in which KTR are randomly allocated to receive either high-dose folic acid, vitamin B12, and vitamin B6 or no folic acid and customary low doses of the other vitamins (17). There are limitations to this study. Although prospective, our analyses are still of observational nature; thus, confounding by unmeasured factors is possible. The only known potential confounder of the associations of interest that is missing from our database is smoking status. Smoking has been demonstrated to be a risk factor for both mortality and allograft loss and is also associated with tHcy levels (18). However, the prevalence of smoking is likely low in this population, and the independent association between smoking status and tHcy has been shown to be weak (18). Therefore, we suspect that the confounding from omitting smoking status is actually moderate at best. In an earlier study of tHcy and cardiovascular disease occurrence in KTR, smoking did not confound the association between tHcy and an aggregate end point of cardiovascular events and death (9). 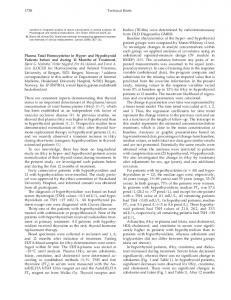 Furthermore, questions have recently been raised as to whether tHcy has any cause– effect relationship with the outcomes studied, and elevated tHcy concentration may possibly be a surrogate of certain disease conditions. We did not conduct any serial assessments of tHcy during follow-up. It is important to note that the present study does not prove causality of the associations found. Finally, repeat measures of renal function were unavailable for study, which precluded us from modeling the association between tHcy and the outcome of difference in renal function in this sample. In summary, from this prospective study, we provide evidence that tHcy is associated not only with all-cause mortality but also with kidney allograft survival. Further research is urgently needed to establish successful treatment measures to lower tHcy in these patients and to establish the efficacy of such measures on reducing the rates of these important outcomes in KTR. 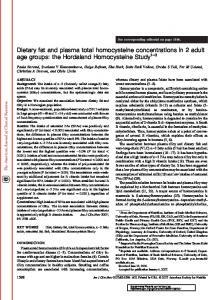 Report "Fasting Plasma Total Homocysteine Levels and Mortality and Allograft ..."